Andrzej Zulawski’s last film, COSMOS, from Kino. Marlon Brando’s first and last film as director, ONE-EYED JACKS, from Criterion. Assisted by the intrepid Stephen Horne, editor, I made video essays for both discs. Nice font! 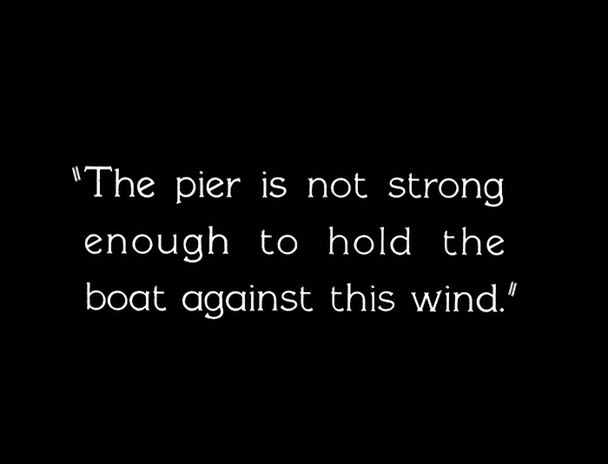 Upgraded my copy of STEAMBOAT BILL JNR, but still very curious to see the alternate version, made from different takes, recently unearthed and released by Kino. The copy I obtained, sourced from God knows where, includes a “stunt analysis” by David Robinson, the formidable silent comedy expert and Chaplin biographer. The trouble with this is, I’m not sure if Robinson’s analysis is always correct — it’s mixed with conjecture in a way that’s not always clear. The hurricane causes the entire hospital to lift skywards like Dorothy Gale’s place. In fact, I think I “learned” about this special effect in the excellent documentary A Hard Act to Follow, by Lifetime Achievement Academy Award Winner Kevin Brownlow. Anyhow, when Robinson claimed the hospital was yanked away full-sized by a 100 ft crane, I was highly skeptical. Lord knows, Keaton was capable of insanely elaborate and gigantic stunts, but this seemed excessive, even for him. Then I noticed that there’s a visible incision at ground level in front of the building, noticeable in the preceding shot. 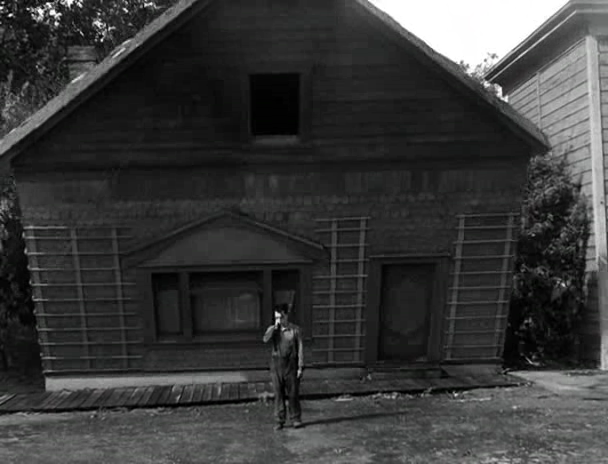 And then I noticed the building’s shadow, which lifts off Keaton just as the building does. That’s a full-scale hospital interior with Keaton in his bed, so if anything’s casting a shadow, it must be full-scale too. But here I think I can add to Robinson’s interp. 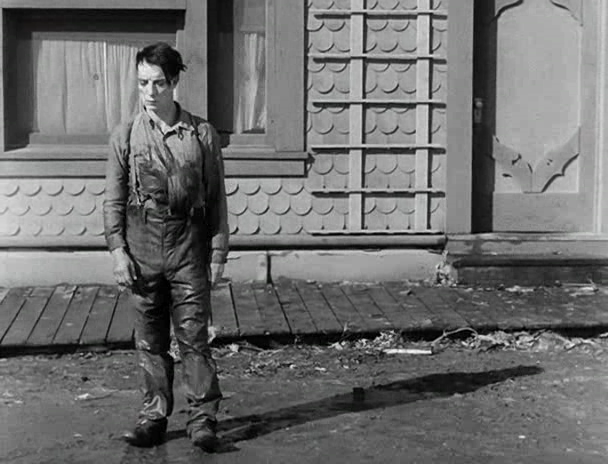 In arguably the most iconic and celebrated visual joke of the silent era, Keaton stands before a collapsing building, which passes harmlessly around him, with a maximum of 3 inches of clearance, as he happens to be standing directly under a narrow window. Keaton’s cameraman had to look the other way while filming this. Buster himself, his marriage and career in crisis, reported not particularly caring if he lived or died at that moment. It’d be quite a way to go! Robinson remarks that Keaton had nails driven into the ground to mark his position (the only real safety precaution taken). He then says that the nails are visible in the above shot, and that you can see Keaton touching them as he stands up, ensuring that his feet are correctly placed. But I don’t see the nails: there’s all kind of debris on the ground, so some of that COULD be nail-heads, I guess, but it’s highly uncertain. And anyway, Keaton’s hands never pass over the area where his flap shoes end up. Furthermore, this is a different shot from the one where the building collapses, so the nails don’t absolutely need to be present, and certainly shouldn’t be visible. This got me wondering whether the above shot might have been taken simultaneously with the famous master shot, using two cameras. 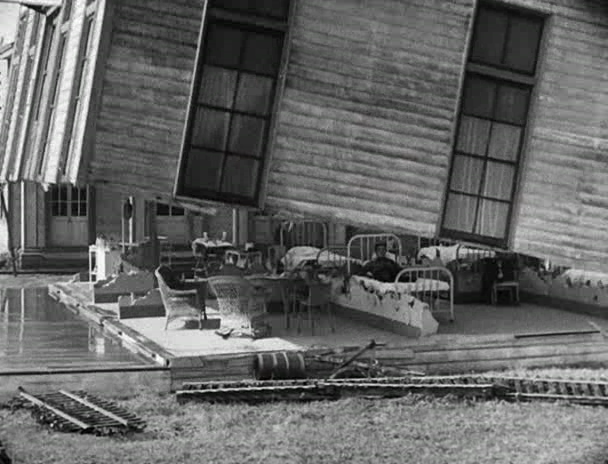 But no — Robinson makes the point that no wind machine was used for the building drop, since the aircraft engines Keaton was using might have caused the facade to shift and hit him (and it was a solid frontage, too — if it had been built lightweight, it might likewise have twisted and struck Keaton). But in the closer view, we can clearly see leaves and other debris moving about. So this shot was definitely taken separately from the action of the main stunt. Robinson’s observation about there being no wind in the wide shot is a very good one, though — it led me to spot the waving tree branches at left of frame, and realise that they’re being waved by a hidden rope, in order to keep up the illusion of a hurricane. Other trees, further in the distance, are actually stationary, but the artificially shaken branches produce an effective illusion. On the whole, Robinson’s comments do more to elucidate than obfuscate, and I wind up impressed by the light he’s shed on this much-analysed sequence, and impressed all over again by how much artistry and artifice is crammed into it.